Homeport Sales Manager Angela Cradle explains the amenities of a new home in American Addition. Participants in the State Auto-sponsored Strengthening Communities Bus Tour arrived on March 20 at a recently completed single family home in the American Addition neighborhood in Northeast Columbus. Homeport has completed 21 homes in American Addition and expects to begin construction on another 14 in 2019. Homeport CEO Bruce Luecke leads tour. The tour included a stop at Homeport’s Marsh Run community in southeast Columbus and the Eastway Village senior community in Whitehall. Organizations participating included CCIIR, Catholic Foundation, Civista Bank, United Midwest Savings, Heartland Bank and First City Bank. To learn how to participate in future Homeport tours, contact Homeport Senior Resource Development Director Laverne Price at 614 545-4891 or laverne.price@homeportohio.org. The next tour is May 15. Register here. Columbus Metropolitan Club program held at The Boat House at Confluence Park. 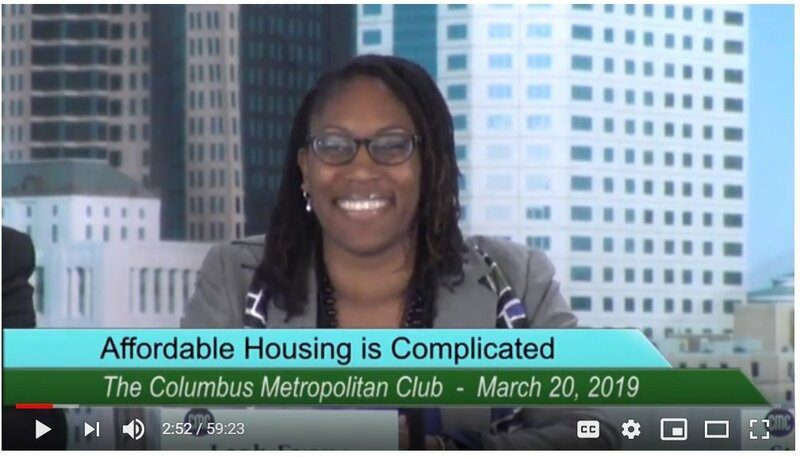 Homeport Vice President of Real Estate Leah Evans was a panelist at the Columbus Metropolitan Club’s March 20th discussion, “Affordable Housing is Complicated.” The conversation came on the heels of a CMC meeting in January where the Building Industry Association highlighted a report stating that 14,000 housing units should be added to the area annually, instead of the 8,000 being built. Joining Evans on the panel before a packed lunch-time audience at The Boat House was Curt Moody, CEO of award-winning, Columbus-based national architectural firm Moody Nolan, and Steve Schoeny, Director of the Department of Development at the City of Columbus. Evans, Moody and Schoeny were questioned by Andy Chow, a reporter and producer for the Ohio Public Radio’s Statehouse News Bureau. To watch and hear the discussion in its entirety, including housing challenges now and in the future with projected population growth, click here. Intern Erica Copley created a movie projector prop for the ‘Hollywood’ theme senior prom. Three Ohio State University College of Social Work interns with Homeport are busy creating the second annual “Senior Prom” for residents of Homeport’s senior communities . The prom will be held again at Elim Manor on April 10 and will have a “Hollywood” theme. Interns planning the event are OSU students Erica Copley of Pataskala, Lauren Mogielnicki from Marysville and Duane Gray of Columbus. Last year’s casino themed “Senior Prom” event drew 75 participants for games, food and music and special drawing prizes. In case you missed it, watch a video from last year’s program. Homeport has been notified that Neighborhood Reinvestment Corporation, DBA NeighborWorks America, will be forwarding $162,000 for operations and a $190,000 capital grant for 2019. The funds will support affordable housing and community development activities. Homeport also received a $4,000 grant for Community Leadership Planning and a $7,000 grant for Community Impact Measurement. 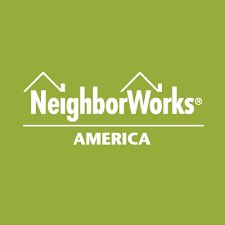 "Support from NeighborWorks helps us expand our efforts in closing the gap in affordable housing and in serving our residents, learning their needs and connecting them to community activities, from after school programs to health care," said Homeport Chief Financial Officer Valorie Schwarzmann.